With Christmas finally over, I can get back to my regular posts. Right before Thanksgiving me and my Bestie spent the day junking and this is one of the treasures we picked up. something with chicken wire doors was perfect. So here she is before her makeover. glass in the window panes. CeCe Caldwell Paint in Blue Montana Sky. The girls over at Bungalow 47 gave me a sample to try. Hit it with a little wax and moved it into the loft. I think it’s a keeper! Season 3 of Downton Abbey starts tonight! Your cabinet looks so gorgeous!! I love all your vintage quilts. That sure is a keeper.You did such a great job on painting it. I love the beautiful blue and the texture of the paint. Good thing you’ve got those Brawny fellows to carry that up to your loft!! Yes, I can’t wait for the season premeire tonight of Dalton Abbey! Your cabinet is wonderful. I love the idea of chicken wire. I live displays of quilts, but have nowhere to put a cabinet like that. I am seeing reference to Downton Abbey everywhere. We don’t own a TV so I have never watched it, but I think I need to start watching on Netflix. I read an article this morning in the local paper and I discovered it is created by Julian Fellowes who also wrote Gosford Park which is one of my favorites. And I love anything with Maggie Smith. The cabinet looks GREAT! I love the new color(s) and the chicken wire. 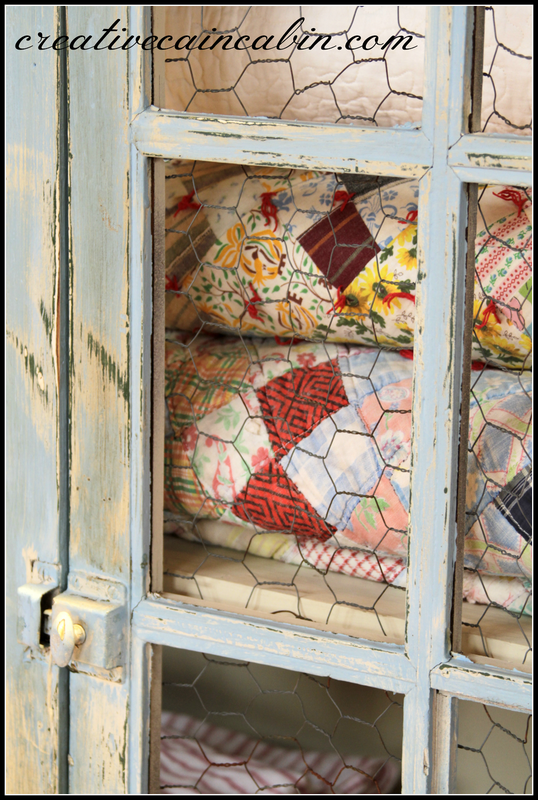 What a perfect place to store your quilts. Awesome score Dawn and I love the makeover you gave it!! 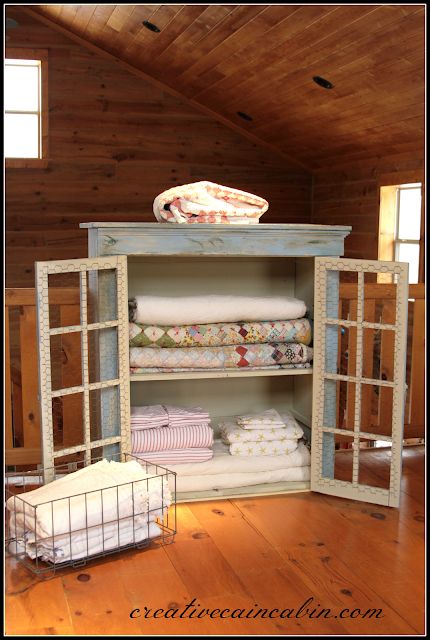 Perfect place to display all your pretty quilts! Just beautiful Dawn! 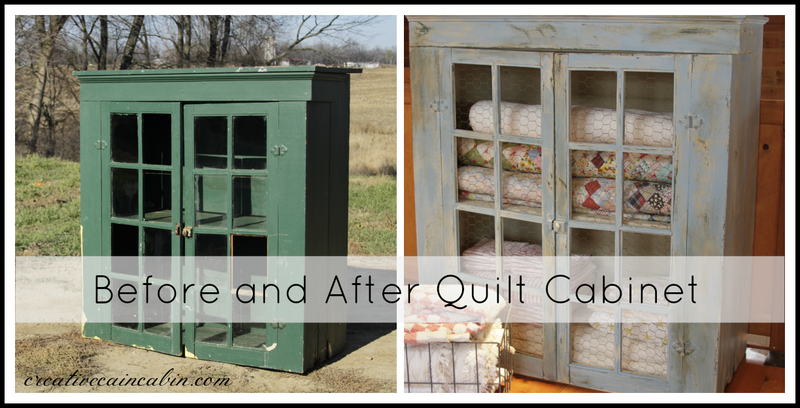 The quilts look so pretty in it, I pinned the before and after pic to my board “Before and After”! I’m going to try again with Downtown Abbey, tried watching it in season 1 just didn’t grab me but with Shirley McClian in it now I’m going to watch again! Everything about that cabinet is perfect now! I have the same “thing” as you! I, however, still have no vintage quilts. I’m on the look-out though! Your cabinet is stunning. You are so good at picking and renovation it could be your business. “Dawn Cain Designs” or something like that…love it. What a beautiful paint color you chose! I can see why it’s a keeper. I LOVE it! 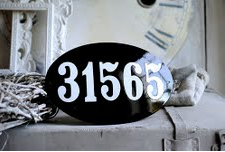 I wish I could find a piece like this. PS, I’ve already watched all of season 3 for Downton Abbey, my husband and I downloaded them. It is one of our favorite shows. Wow, great transformation. I like that you kept a hint of the hunter green. Love the look of the chicken wire too. I have my dvr set for Downton! I can’t wait. I will watch it tomorrow morning when the kids go to school. I just love that show. I’m hoping it is so worth the wait. Have a great time tonight! This cabinet is absolutely gorgeous!! Gives me tons of inspiration to go on a thrift store search to find one to transform for myself!! Thanks for sharing!! I’ll take the cabinet, thank you kindly. Seriously…so my style! I was hoping you’d be able to join in the Old Time Party, maybe next time. Dawn, I love the new look. I looked at some vintage quilts yesterday at a stop on our short road trip. They were all just too expensive for quilts that were falling apart so I will keep waiting for another bargain to show up. So happy that you were able to make the Old Time Party! Thanks for sharing! 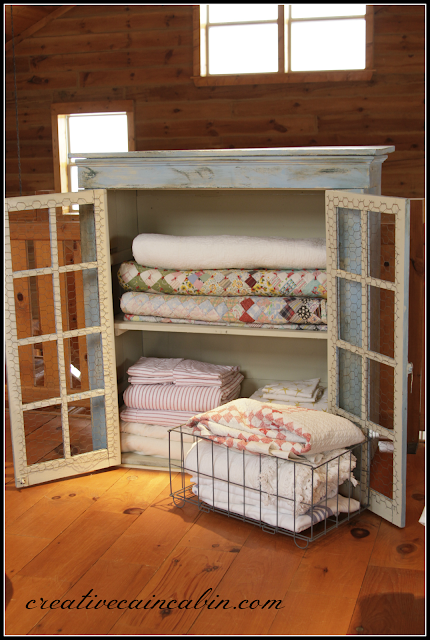 Cute cabinet and really cute quilts. I love the color and the chicken wire. I did not know you could spray chalk paint. I learned something new today. Thanks. Oh my is did that turn out beautiful. I love the color too. Thanks so much for sharing Dawn. I love your cabinet. The chicken wire is perfect. Your cabinet is awesome Dawn! It looks like a completely different piece. Great eye you have for color too! Love the chicken wire! this turned out beautiful! i really want a cabinet to show off my quilts in. hope i find one someday. your quilts are GORGEOUS!! turned out beautiful!…and I absolutely LOVE the chicken wire added! It turned out so well! I like the soft layers of colours and the chicken wire looks great. You have some lovely quilts too. The hutch turned out beautifully, Dawn. I think it’s perfect for your beautiful collection of vintage quilts and bedding. Hi Daw…Oh, My goodness! 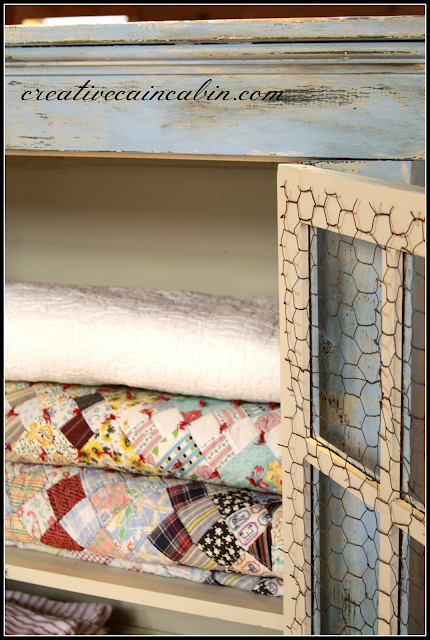 Your quilt cupboard is gorgeous! It is so cottagey and you selected such a dreamy shade of blue. Thanks for the heads up on Downton Abbey! Dawn, this is truly a transformation of something someone might have tossed out. It looks fabulous, I love your choice of colors and the chicken wire just adds the element of fun to the piece. Congratulations on starting 2013 off with a complete makeover of an 90’s piece. Thanks for sharing. Oh, I love the colors that you used, much better than the Hunter green. The cabinet turned out beautiful! All your quilts and bedding look like the perfect match. 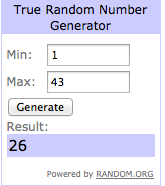 Visiting from Debbiedoo’s party and am now your newest follower. I hope you’ll come by for a visit too when you can. The cabinet came out so beautiful. I love the chicken wire too. Great job it really looks great. 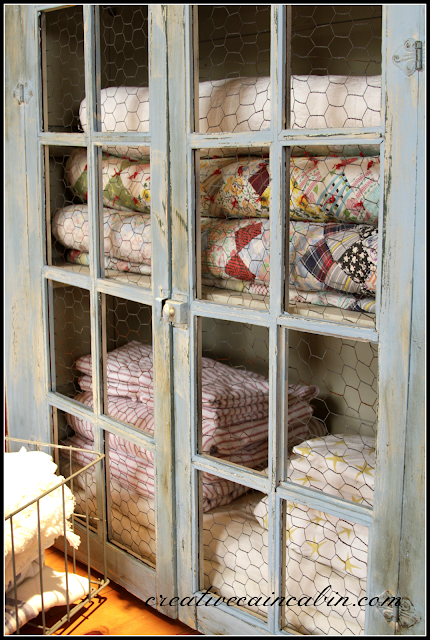 I love the simplicity and coziness of quilts piled in see through cabinets! This is beautiful! The cabinet is gorgeous in grey/blue. I love the quilts and linens peeking out via the chicken wire. CC had me majorly distracted yesterday. Blessings to you in 2013! I love quilts too. Great cabinet and great makeover. That is a fabulous little cupboard for your quilts! What a beautiful cabinet. I also love old quilts, sheets, tablecloths, etc. I guess vintage linens as a whole. They are just beautiful. So nice visiting with you today. I love old cabinets and chicken wire. Awesome job! Beautiful makeover! I love your new cabinet and the chicken wire is just perfect! Very, very pretty! Love what you did, now it looks just how it always should have! You have great taste! I was wondering if you got my email with the picture of an old quilt sign I have had floating around here that I thought you might like to go with your great cabinet. Did not hear back so was not sure if you got it. It needs a new home and I would be glad to ship it to you if you think it is something you can use. If it is too chippy shabby chic I undestand that’s ok too just thought I would offer it to you since you did such a great job on this cabinet. Swooning! 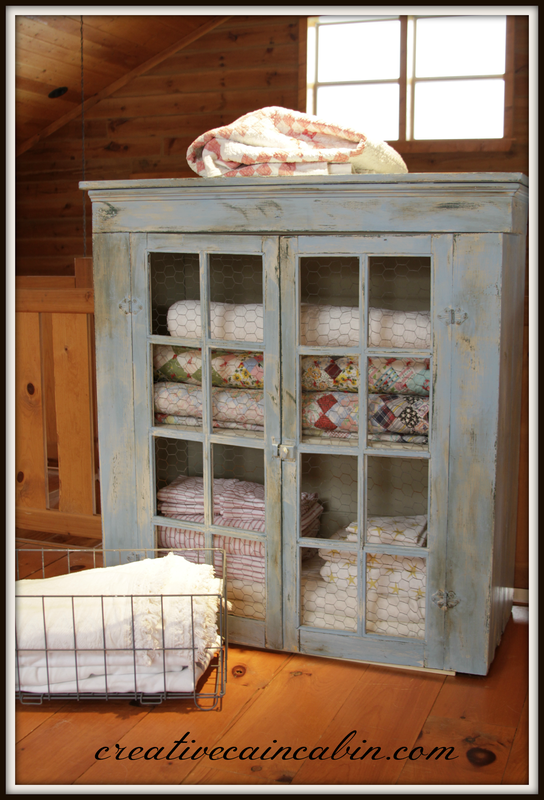 Love the quilts and the cabinet looks just perfect. Cute, cute, cute! Love the color you chose, it’s absolutely adorable! I love your cabinet… so gorgeous… and you gave it the perfect makeover. The quilts inside are so lovely. Charming cabinet and thanks for sharing it at my party (you have received a lot of hits). Look just lovely! You did a great paint job! I have a similar cupboard for outdoor use. I keep gardening things inside. It used to be a rabbit hutch that we found in our barn when we moved here. 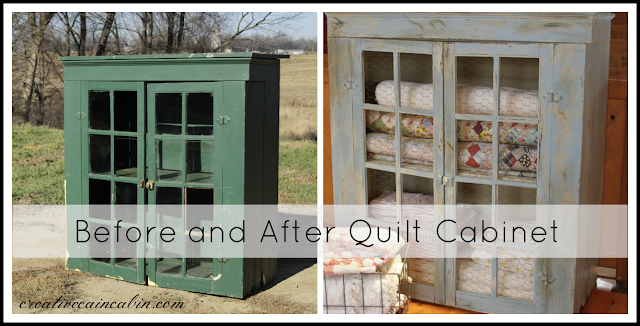 I adore your quilt cabinet Dawn and the quilts inside too!!! OMYGOSH…I NEED a quilt cabinet like this. You did a magnificent job on it and it’s AWESOME. I love the way it turned out, Dawn! A great transformation. There’s nothing cheerier than seeing a stack of quilts, is there? Dawn, what a great piece! You made it so lovely! It is just perfect for your linens! I do love that chicken wire! :) Thank you for sharing this at Rustic Restorations Weekend! What a lovely piece. Do you think it was the top to a china cabinet in a previous life? I love your beautiful quilts! The cabinet is truly gorgeous. I have always loved the look of folded quits, I just adore it with the chicken wire. I’m pinning it. LOVE LOVE LOVE IT!!! That makes such a great way to display all your quilts!!!! I would love to find something like that! I just found your blog thru google while looking for “vintage quilt china cabinets”. 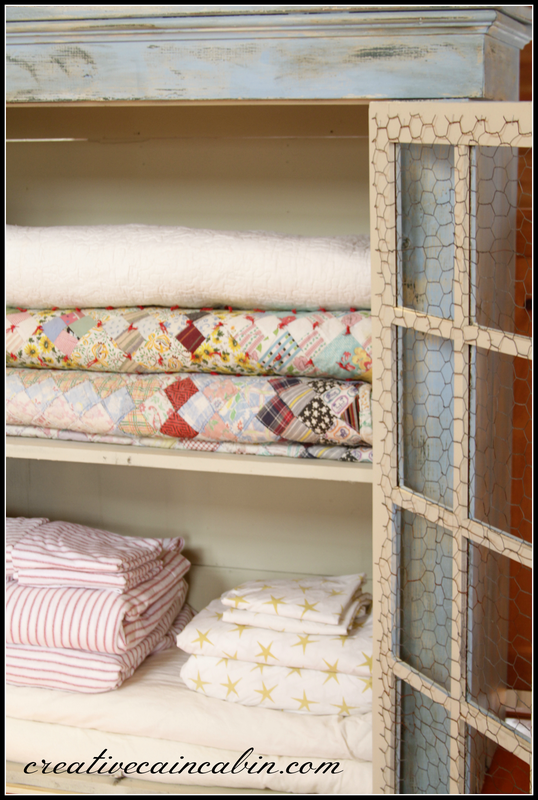 I have all of my vintage quilts stored in an old china cabinet right now and I LOVE the look. I have also been thinking about painting it. I would love your opinion in removing the glass. Do you think the older quilts need to breathe? I wonder if keeping them behind glass is bad for them in anyway. Jen, I have no idea about that, I removed the glass because it was broken but now the dust can get through.